Nafplio or Anapli, the capital of Argolis, is one of the most famous and beautiful cities of Greece. It is an important administrative and tourist center, with constant traffic throughout the year. According to mythology, the city took its name from its founder Nafplios , the son of Poseidon and Amymoni. In antiquity, Nafplio was basically in the shadow of Argos, serving as its port from the 7th century BC. 999 or 857 are the steps leading to the top of Palamidi Discover it, climb on the steep hill that offers a unique panorama of Nafplion and its sea. The fortress was built in record time between 1711-1714 and is truly impressive. The acropolis of Nafplion, which the Ottomans called Its-Kale, was built by the Venetians and then passed into the hands of the Byzantines and the Turks. It consists of three levels, each of which was a separate castle with walls built in different historical periods. From the rock of Acronafplia you will enjoy the unique view of Bourtzi and the beach of Arvanitia. It reminds of an elegant stone sculpture. When you have ridden by boat the few meters separating the islet of Agioi Theodoroi from the coast and upon your arrival to the Venetian castle, the impression will change. 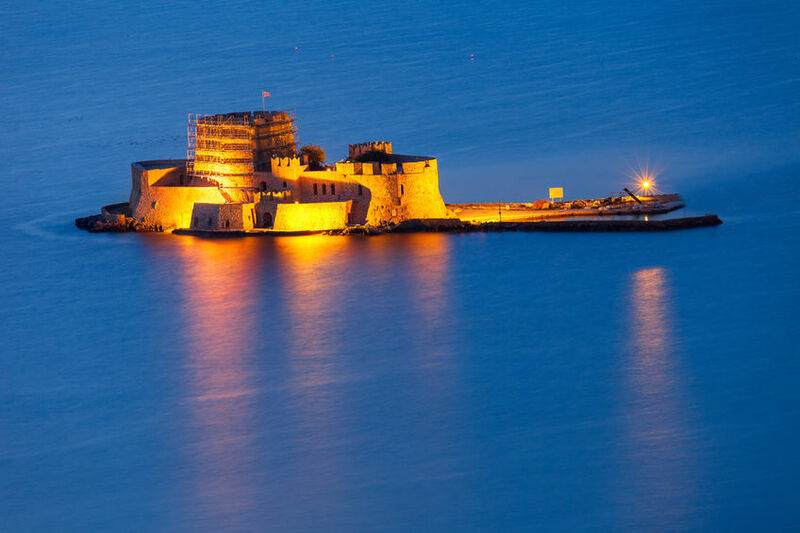 The castle was built in 1473 and its shape looks like an irregular hexagon, is one of the most important sights of Nafplion and does not only have peaceful memories. It was the home of the executors of Palamidi, the place of residence for two governments in 1824 and 1827, but also a luxury hotel. Today it hosts cultural events that ward off … the ghosts of the past.